Children in Benin, formerly Dahomey. ACCRA, Ghana — To say that Ghanaians have been merely affected by the 24-hour power off (DUM), 12-hour power on (SOR) “Dumsor” routine is an understatement. The nation and its residents are severely hampered by it. Businesses cannot function with regularity and efficiency without the need for multiple generators–a last resort that has quickly become a necessity in Ghana’s electricity-deprived capital city of Accra. Apparently, where the sun shines the brightest, the electricity struggles to keep up. While many are willing to share their frustrations with Dumsor–on its webpage, the Ghana Institute of Journalism (GIJ) devoted a featured student work to this effect–fewer are willing to offer up solutions. Much advice resembles that from the GIJ article, giving pointers on how to “survive” the inconvenience of Dumsor. The list of tips ran from humorous to vague to patchwork solutions to problems that require deep thought, not to mention big fixes. The untitled GIJ piece opined that residents should get a smartphone with a torch light, a long-lasting battery, and “a radio app to keep you tuned in to your favorite radio stations”–all while still in the dark. Or better yet, plan accordingly by completing any tasks requiring electricity first, before the power goes down. Get those tasks off your checklist and free your shoulder! You can start by tackling the ones needing electricity so you don’t have cause to worry when ECG does their thing. LOL. It’s only more than halfway through the essay that a mention of solar energy, a serious consideration, albeit one with copious uncertainties, arises. There has been talk of exploring other options like the wind and the sun to generate power for the country. Those who’ve been on solar power can testify of its effectiveness despite the costs involved. If you can afford to have solar panels installed at your home or workplace then you might want to speak to solar experts and get panels installed for a better experience. Regarding the implementation of solar energy in the nation, there has surely been much more than talk. 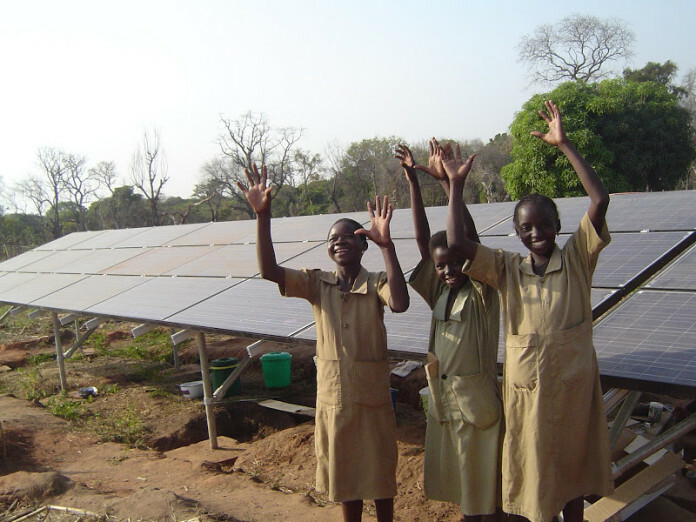 For one, the Association of Ghana Solar Industries (AGSI) was founded in 2006 for the sole purpose of uniting solar industry stakeholders, companies, and other renewable businesses to work towards the development of alternative energies in Ghana. In Accra, the Solar & Off-Grid Renewables West Africa conference, held earlier this year in April, joined solar experts in discussion on how to best utilize current technology for West Africa’s growing electrical consumption. 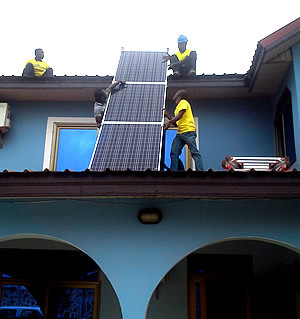 Brighten Ghana, a renewable energy company, installs solar panels for a family home. Currently, 30 percent of Ghana’s population, around 5 million residents, live in areas that are relatively inaccessible for electricity. These residents will best be serviced by mini-grid or off-grid options, exactly those which solar power can reach. In the country’s Western, Central, and Greater Accra regions, solar power plants constructed by multinational firms have provided hundreds of green jobs for Ghana’s economy and are expected to add energy to Ghana’s existing electrical grid. For years, the nation’s solar energy possibilities and relative economic stability has attracted a rush of investors. British developer Blue Energy’s 2012 project for a power plant in Ghana was, at the time, the largest solar development project in Africa. Following the announcement of this project, the Ghana Energy Commission received such a rush of applications that it had to put a hold on additional projects. Funds for the solar energy development total $230 million US dollars from multiple of sources: the Government of Ghana ($16 million); the Climate Investment Funds; the African Development Bank ($53.5 million); the Sustainable Energy Fund for Africa ($40 million); the International Finance Corporation ($10 million); and other development partners ($26.5 million), private financiers and beneficiaries ($84 million), who for various reasons remain unidentified. The Ghana News Agency has reported that Ghana should soon witness an increasing boost to its solar energy power capacity. 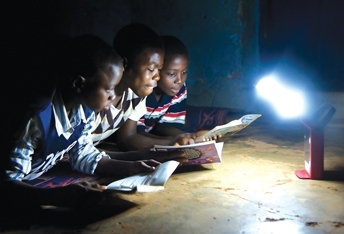 If all goes well, the Ghanaian government will distribute 2 million solar lanterns and outfit 30,000 solar home systems by 2020. Although trumpeted by solar powers, these gains have yet to be noticed on a large scale. Over the next few years, it will be more evident whether the investment into solar energy will turn real advances in renewable energy or more postponements to experience its fruition. Still, there are opponents to the energy rush. Some question whether the investments in solar energy are moving at too rapid a pace. Do people really understand the technology, its use, and its replacement costs – what happens when panels need to be upgraded? In this case, perhaps solar energy is just another cycle of debt to be adopted by the country. Unless Ghanaians themselves understand how to produce all the solar technology they consume, they will be indebted to the manufacturer—at whatever cost he demands. These economics of renewable technologies should cause even the optimists of a green world to approach adoption of new machinery with caution. School boys gather to read by a light source while the electricity is down. Are there not other simpler solutions than solar energy, which require the resources of multinational companies, to relieve residents of Dumsor and curb the current energy crisis? Are there not solutions that do not require global muscle, but only the brains of Ghanaians and West Africans? Ghanaians certainly have primary and secondary educational systems that rival, if not surpass, the finest of the elite anywhere in the world. Though it lies in the puzzle of applying these ordained smarts to real world problems that find even the brightest minds stumbling. For all the brilliant African engineers with freshly printed diplomas tucked underneath their armpits, Dumsor still reigns as king. Alas, we shall no longer look to humans, but gaze at the Sun–our God, Ra–for answers.